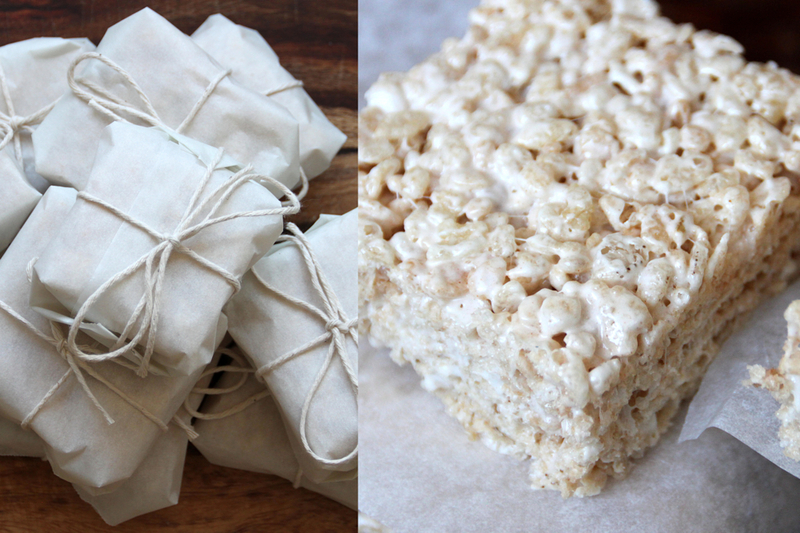 There’s something so nostalgic about rice crispy treats. I remember making them with my mom as a child and always thinking of them as much more special than cake or ice cream. 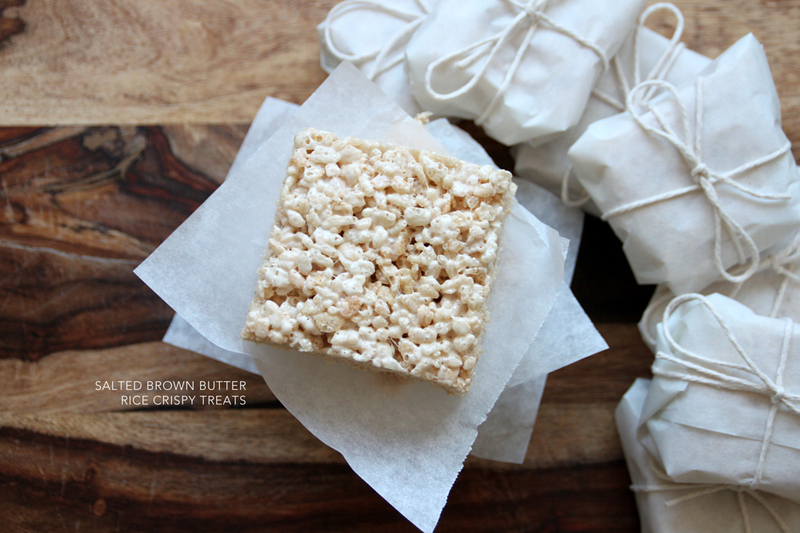 Outside of these cearealy treats and hot cocoa, I’m not a huge marshmallow fan but something magical happens to the gooey confection when melted and combined with butter and crispy rice that I cannot resist. I wanted to step it up a notch from the standard recipe found on the side of the cereal box so I followed this recipe which uses brown butter and a pinch of sea salt. The result was a nutty, crispy, melty, sweet and salty, square of goodness. So good that I could have eaten the whole batch. Definitely find the time to make these, they’re wonderful! Enjoy! P.S. Here’s a quick tip, when you’re cutting these guys, make sure your knife is buttered or sprayed with a cooking spray to ensure clean cuts with no sticking. xoxo! Those little packages are so adorable! And browned butter is good with just about anything. 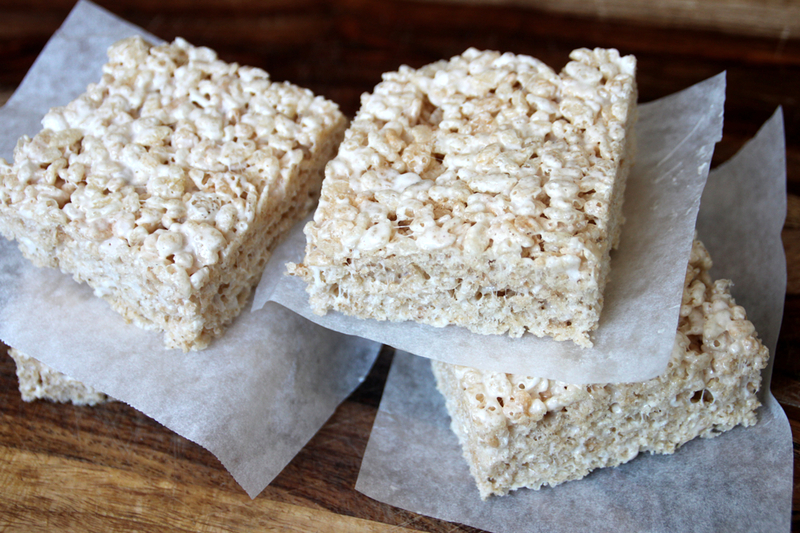 I agree…not a huge marshmallow fan, but I do love a good Rice Krisipie treat (in fact I made a whole “cake” of them for my rehearsal dinner). I’m definitely going to try this out. i made these for Halloween! only i added orange zest and dipped them in chocolate. i love your wrapping – so elegant.